In this seventh-grade humanities lesson, students prepare a Black-Eyed Pea Stew and examine the exchange of foods between Eurasia, Africa, and the Americas during the Columbian Exchange. Discuss the major economic and social effects of the Columbian Exchange on Eurasia, Africa, and the Americas. Describe how the exchange of food crops during and after the Columbian Exchange impact the foods we eat today. Discuss the exchanges of plants, animals, technology, culture, and ideas between Eurasia, Africa, and the Americas during the Columbian Exchange. Realize that different plants and animals originate in different regions of the world. Copy the Black-Eyed Pea Stew recipe to hand out. Copy the Spiced Butter recipe to hand out. Copy the Berbere recipe to hand out. Gather supplies for the Chef Meeting. Collect all the tools and ingredients, and then distribute them to the tables. 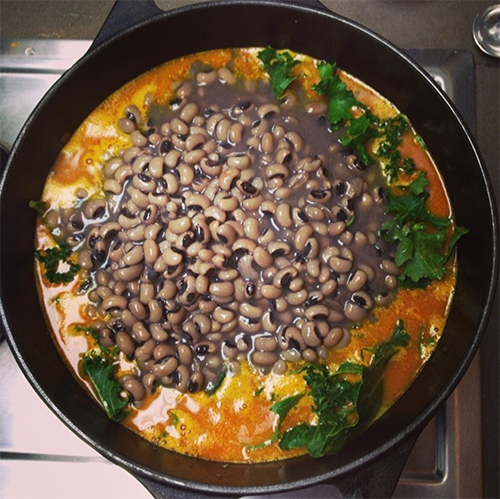 Welcome students back to the kitchen and introduce the recipe for the day: Black-Eyed Pea Stew. The main ingredient in Black-Eyed Pea Stew is black-eyed peas, small white beans with a black spot that looks little bit like an eye. These beans are one of the oldest foods in the world, eaten as a staple crop in Ethiopia and throughout Africa for almost 6,000 years. But the recipe we’re making today would not have been possible to make until about 500 years ago. Today we’re going to talk about the Columbian Exchange, a major historical event that fundamentally changed how people all over the world ate and part of the reason that we can make this recipe today. Let’s start by taking a look at the visual aid. This map shows different foods and where they originated. Until about 500 years ago, all of these foods were almost exclusively found in the places where you see them on the map, so lots of the foods we know and love today did not exist. So for example, there were no such thing as garlic fries. Ask students: Why not? Because potatoes are from South America and garlic is from the Middle East. And there was no such thing as pasta with tomato sauce, hot chocolate, or BLTs. Ask students: Where did the ingredients for those originate? There were some foods that originated in Asia that maybe you could find in Europe, or that originated in Europe that could potentially be found in the Middle East for example, but there were absolutely no foods from the Americas in Europe, Asia, or Africa, and vice versa. Why was this? What happened 500 years ago that may have changed this? Does the year 1492 ring a bell for anyone? In 1492, Christopher Columbus sailed from Spain to the Americas and made the first European contact in the Americas. But let’s take a step back, because our story really starts all the way back at the time of the Silk Road. Who remembers one of the major foods that traders from India traded on the Silk Road? Spices. People in Europe loved spices. They had an insatiable appetite for them, so much so that the Romans even mined gold just to pay for spices. Spices were very expensive. Why? There was a relatively small supply relative to the demand, and all spices traded from India went through the Middle East, from trader to trader. Every trader took a cut of the profits from the sales, and so by the time they made it all the way to Europe, they were very expensive. European royalty were determined to find a better, cheaper way to get spices. They came up with a brilliant idea: They couldn’t get the spices by going east, but maybe they could find a new passage to India by sailing west and have a cheaper supply of spices without the middlemen. So the Spanish monarch, Isabella, sent the explorer Christopher Columbus out to find a new route to India. They had absolutely no idea that the entire continents of North and South America were right in the middle of their planned route. Christopher Columbus sailed west across the Atlantic Ocean and in 1492 landed in the Americas. He was convinced he had found India. He didn’t find any of the spices Queen Isabella was looking for, but he did encounter many new foods, plants, and animals he was completely unfamiliar with, and he met some of the native people of the Americas. He came back three more times, and the Spaniards sent other explorers as well, to investigate this land that was novel and unfamiliar to them. As they began to meet and make contact with more native people, they began to admire the beautiful gold and gemstone jewelry that some of the local rulers wore, and heard stories of rich empires farther inland. The Spanish empire sent more ships and the conquistadors sought to enrich themselves and their crowns, and convert the locals to Christianity by any means necessary. European explorers began to conquest and colonize the Americas, leading to the fall of the Aztec, Inca, and many other civilizations. As they did so, they took over native agricultural and mining enterprises and sent foods, gold, and other precious metals and gems back to Europe. Europeans sending goods and resources from the Americas back to Europe was part of what we now call the Columbian Exchange—the exchange of plants, animals, technology, culture, ideas, diseases, and people between the Americas, Europe, Africa, and Asia from 1492 to the mid-1600s. But Europeans didn't just bring things back from the Americas to Europe—they also brought things with them that they introduced to the Americas. Perhaps the most influential item traded as part of the Columbian Exchange was disease. Out of everything exchanged during the Columbian Exchange, the diseases brought from Europe to the Americas made by far the greatest impact on human history. Europeans brought diseases like smallpox, chicken pox, measles, and the flu. Today these diseases are generally no big deal, but back then, the native peoples of the Americas had no immunity, so they caused widespread death. Diseases traveled quickly throughout North, Central, and South America, much faster than the European explorers themselves, because they were carried and passed between Native Americans. It’s estimated that within the first 100 to 150 years after 1492, between 85% and 95% of the native populations died. That’s like if 9 out of every 10 of you suddenly got mysteriously ill and died from a disease that no one had ever seen and no one knew how to cure. The European rulers became limited in their productivity because of the devastating impact of their diseases and genocide. There were very few native people left to work on the farms and in the mines that supplied them with the riches and foods the crowns desired, especially sugar and tobacco. Wanting to further enrich their nations, European rulers looked to find a new source of labor. What do you think happened next? Where do you think they turned? Europeans began to enslave people from Africa to work on American plantations. This was how the Columbian Exchange led to the Atlantic slave trade. This remains a major part of our country’s history and present-day reality. And this brings us back to our recipe. Who can see where black-eyed peas came from? West Africa. The West Africans who were enslaved and brought to the Americas were not able to bring very much with them when they came. But they knew that if there was one small thing they could bring that would remind them of home and give them hope for survival and resilience in an uncertain future, it was seeds. Have you all heard of cornrows? Small, tight braids in your hair. The name comes from the practice of enslaved Africans hiding seeds of corn and other crops in their hair on the journey across the Atlantic. When they made it to their destination, they could unbraid their hair and plant the seeds to feed themselves. Black-eyed peas were one of the foods that traveled to the Americas this way. In addition to black-eyed peas, our recipe today will use ingredients from all over the world, including tomatoes from the Americas, coconut milk from East Asia, spices from India, and garlic from the Middle East, just to name a few. As we cook and eat today, take a moment to reflect on the stories and memories that exist behind everything we eat. Ask students to wash their hands and go to their table groups. Meet with the table groups to review the recipe and assign jobs. Prepare the recipe and set the table. Ask students to use their fingers to rate the food on a scale of 1 to 5. If there is time, have students use the visual aid to identify foods that they eat that incorporate ingredients from three or more continents. Different students will have very different responses to, relationships with, and background knowledge about this topic that may be related to their identity. Silk Road: We refer to the Silk Road at the beginning of the Chef Meeting in this lesson as a way to connect back to the four-lesson Silk Road series students did in sixth grade. This is a very foolproof recipe. We always add potatoes, carrots, and greens. Any vegetable that you would like to add is fine. This is a richly flavored, highly seasoned dish that may be surprising for some kids and familiar and comforting for others. Black-eyed peas prepared in the dish Hoppin' John is a dish traditionally eaten on New Year's, especially in African-American communities in the South. Berbere is a spice mix that contains many different spices. It is hard for students to obtain at home. Make extra spice blend and send some home with students. You can substitute butter for spiced butter and the dish is delicious. Discuss the exchanges of plants, animals, technology, culture, and ideas among Europe, Africa, Asia and the Americas in the fifteenth and sixteenth centuries and major economic and social effects on each continent. Identify aspects of a text that reveal an author’s point of view or purpose (e.g., loaded language, inclusion or avoidance of particular facts). Make connections between the diets of historic cultures and the foods we eat today. All lessons at the Edible Schoolyard Berkeley are a collaboration between the teachers and staff of the Edible Schoolyard and Martin Luther King Jr. Middle School. Ghanaian Black-Eyed Peas, Berbere, and Spiced Butter recipes are adapted from Marcus Samuelsson’s The Soul of a New Cuisine. In "Seventh Grade Kitchen Rotation "